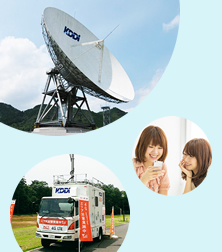 [Establishing new growth pillars] Maximize the "au Economic Zone"
KDDI aims for maximization of the "au Economic Zone" as a new growth pillar in Japan amid maturation of the domestic telecommunications market and the unlikelihood of a significant increase in the number of subscribers. 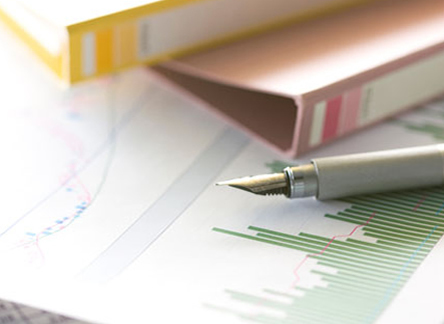 In addition to sustainable growth in the domestic telecommunications business we will generate new revenues on the domestic telecommunications business base. The "au Economic Zone" refers to a new economic zone, built on au's customer base, that includes online content, offline convenience stores and settlement at physical stores, as well as commerce and financial services that extend across both online and offline environments. 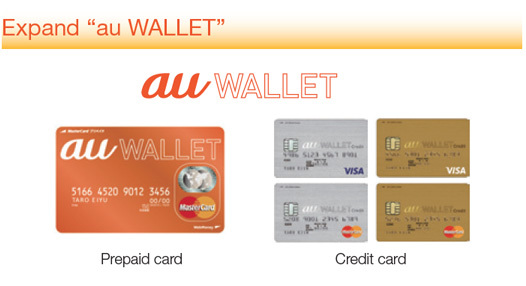 In May 2014, we launched the "au WALLET" prepaid card service as a platform for generating revenues by augmenting revenue from conventional online carrier billing (= "au Simple Payment") with offline service transactions (i.e. at physical shops); this was followed by the launch of the "au WALLET" credit card in October of the same year. As of the end of March, 2016, the number of valid "au WALLET" cards issued (prepaid cards and credit cards) reached 17.9 million, a number that continues to grow steadily. 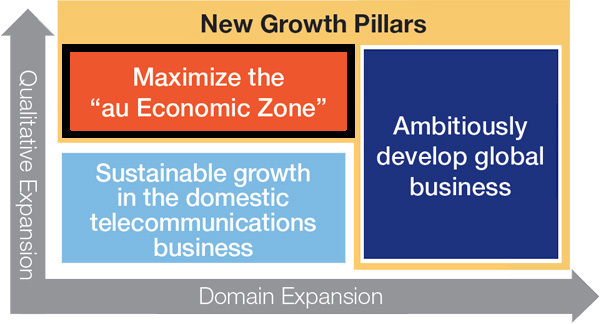 In addition to our conventional telecommunications services, we are working to maximize synergies and expand the "au Economic Zone," utilizing our existing domestic telecommunications business and settlement platform to provide a wide variety of services to customers at every stage of their lives under the banner of "au Life Design." 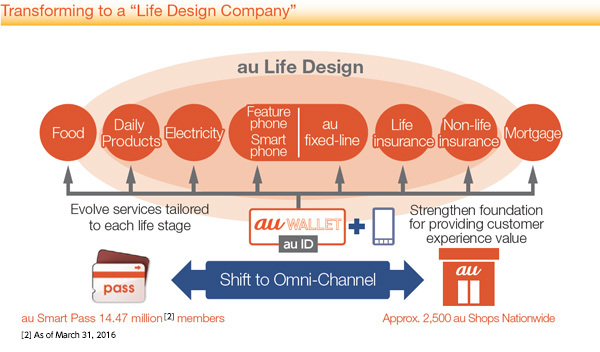 In "au Life Design" KDDI provides food and daily products sold through "au WALLET Market," a commerce business involving actual stores (au Shops), and "au WALLET Market powered by LUXA" online to provide a wide variety of products and services related to daily life. Moreover, in conjunction with the liberalization of the electricity retail market in April 2016, we started "au Denki," a service that provides electric power we get from power companies in each region. 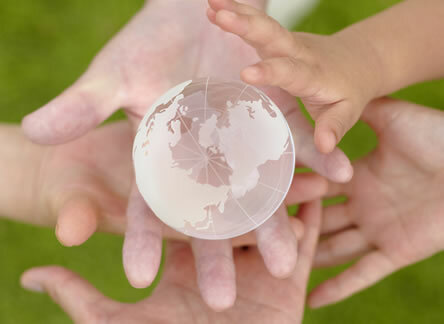 Furthermore, with companies in which we have invested, KDDI also handles financial products as an agent for life insurance, non-life insurance and mortgage products through "au Insurances" and "au Mortgage." 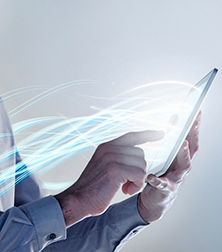 In providing these products, we believe we will create new business opportunities in the coming age by leveraging our strength as a telecommunications operator, and by combining IoT and services. 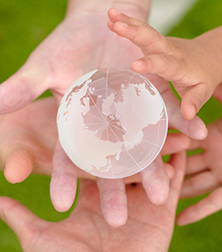 One of our strengths is our contact points with our customers. As of the end of March 2016, there were over 14.47 million members of our online contact point, "au Smart Pass," as well as 2,500 au shops nationwide providing offline touch points, and we will work to advance an omni-channel approach by further strengthening and linking these touch points. In March 2016, we also consolidated Jupiter Shop Channel Co., Ltd., Japan's largest television shopping firm, building further opportunities for new customer touch points. Leveraging these unique contact points with customers, KDDI can in addition to au communications services, make proposals targeted toward customers tastes and interests for all sorts of products and services, including electricity, finance and commerce, as part of "au Life Design." 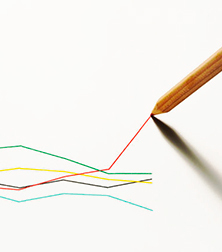 Bundling electricity and financial services with communications services as with the successful example of "au Smart Value" (discounts for bundled mobile and fixed-line communications services) raises expectations of a low churn rate, which is a feature of bundled services. If payment is made through "au WALLET Credit Card" and this becomes the customer's main card, it can also be expected to build a circulation model for WALLET points and increase their transaction volume. 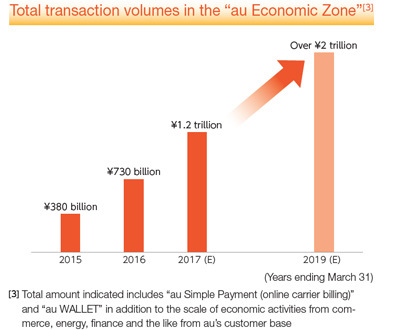 By strengthening these and other services, and building a circulating model for the WALLET points customers given to customers when they use our settlement platform, we aim to expand the total volume of transactions in the "au Economic Zone" from ¥730.0 billion in the fiscal year ended March 31, 2016, to ¥1.2 trillion in the fiscal year ending March 31, 2017, and onto ¥2 trillion in the fiscal year ending March 31, 2019, the final target year of our medium-term management plan. 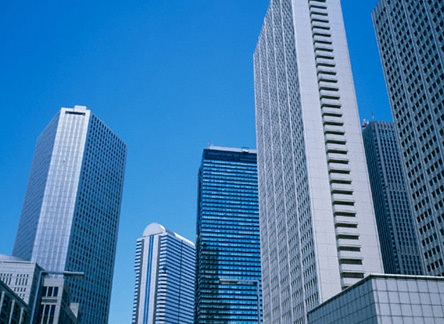 Expansion of Value-Added ARPA with Growth of the "au Economic Zone"
In the fiscal year ended March 31, 2016, value ARPA-value-added revenues sales per au customer―amounted to ¥440. 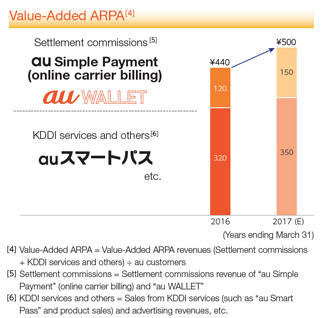 Of this amount, KDDI services such as "au Smart Pass" accounted for ¥320, and settlement commissions from the two settlement platforms ("au Carrier Billing" + "au WALLET") the remaining ¥120. 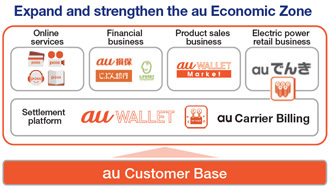 With the expansion of the "au Economic Zone," "au WALLET" settlement fee revenue and revenue from "au WALLET Market" and other services will also increase, and we expect "value-added ARPA" in the fiscal year ending March 31, 2017 to rise 13.6% year on year to ¥500.